Until recently, the island nation of Cuba has been shrouded in mystery for the majority of United States citizens, following the success of Fidel Castro's uprising against Fulgencio Bautisa's Cuba at the end of the 1950's. After a series of violations and affronts to the Eisenhower administration at that time, the US President placed official embargoes to Cuba, while also formulating a plan to take Fidel out of power. Just a few months into his presidency, Eisenhower's successor John F. Kennedy signs off on Eisenhower's final play against the dictator 90 miles across the water. Known commonly as the CIA orchestrated Bay of Pigs invasion, the move to usurp Castro on April 17th, 1961 would fail spectacularly only three days later on April 20th. Around the same time, the United States parked Jupiter missiles with nuclear warheads meant as a flex move against the Soviet Union; a strong Cuban ally. The response from Russia was their own placement of missiles in Cuba, in part of what we know as the Cuban Missile Crisis. In the decades following, the average American heard little about Cuba, great baseball players and the Elián González incident in 2000 not withstanding. During Barack Obama's Presidency, layers of the tension peeled away in diplomacy between him and Fidel's brother Raul Castro. Cuban Americans were the first to be allowed passage back home starting in 2009. Then, students and religious missionaries took the stage. Now on a culture exchanged grounded classification of "People to People", United States citizens can travel to a true cradle of revolution. Decades of isolation from the Cold War finally able to thaw out, and I'm grateful the Cuban people shared their country with us with open arms and a case of cold Bucanero. It will take some time and research before I'll full be able to express my feelings on Cuba as a whole, but I wanted to share choice photos, and information I think may help if you're headed there. How do I get into the country legally as a United States citizen? -You'll buy a plane ticket through your online portal of choice, after which you'll likely be contacted and directed to your airline's visa page at Cuba Travel Services via email. For example, here's the American Airlines page I used. At the time of this writing, the price is $85, and you'll get your visa in the mail with a copy of how to fill it out. After about a week I was called by Cuba Travel Services to verify my selection of visa request reason, which you'll have chosen from on their website if you purchased a visa there. Unless you're headed there for a particular allowed purpose (Journalistic Activity in my case), you'll choose the Educational\People to People visa. Essentially it states you're in Cuba on the notion of culture exchange. If you don't buy it online, you can purchase one at the gate before your flight that takes you into Cuban airspace. Cuba Travel Services will have a kiosk with a visa price set to $100 right in front of your gate. How does the whole money thing work down there for us? Unfortunately your plastic will be rendered completely useless, so take US dollars with you. We changed out our money to the Canadian dollar, but Cuban officials will likely give you shade, and ask if you have US money instead in cold jest. Plus, the conversion rate was a pain to keep track of anyway. I'm not wholly sure the economics of it, but the mindset of most of the Cubans we met was to back their banks with our money, ensuring our overall relations to move forward. You'll be penalized pretty much no matter which way you convert your money, so do as you will. Most importantly I recommend $800 cash per week's travel, unless you have some extravagant excursions planned. How did you find a place to stay, and get around the island? We booked all of our stay through AirBnB. Since people from across the world have been visiting for decades now, renting systems are fairly well established. Hostels are an option, and you'll see signs for them regularly, but that I can't speak to. Either way, your host will likely be the best source of information. Hosts are happy to set up rides around and outside of Havana, since being a taxi driver is more lucrative than being a doctor at this point it seems. With business, Cuba remains largely word of mouth due to the lack of a strong telecommunications infrastructure. Social media promotion won't arrive here for some time. I highly recommend getting a physical travel book to bring with you. We took the DK Eyewitness Travel Guide and it comes complete with walking and driving maps, day plans, things to expect, and a good deal more. What's the food\drink situation like? Unfortunately, the best food is shipped off of the island, due to the government power have first dibs on the best of crops and supplies. I'd say stick to the Cubano sandwich, or black beans and rice as often as possible. Average meal cost is $5, although you'll pay double that at any Trip Adviser labeled spot.The average cocktail price is $2, and bartenders pour HEAVY. Spanish speakers will have an easy time, however I'd say no more than 15 percent of the people I interacted with spoke English. Google translate doesn't work on the island, so you'd better practice. Honestly though, I returned home with a renewed itch to learn and travel to more Spanish speaking territories after going to Cuba. What were some of the things you guys did you'd recommend? 1. Visiting the museums in the heart of Havana. 2. Walking the city streets of Havana, popping into various bars to have a drink and stay cool, or to catch a jam\dance session on a city corner. 3. Taking a tour of Havana in a classic car. 4. Dancing in a cave club on a hilltop in Trinidad. This one is a mystery you should find out by asking around town. Trust me, it'll be more fun that way. 5. Horseback riding through Valley de Viñales should absolutely be on your list of things to do. 6. Spend at least one evening at Fábrica de Arte Cubano. It's feels like a vision of Cuba's artistic and social future. Approaching Havana from Miami; patches of redistributed farm land stand testament to the policies of FIdel's revolution. One of the duties of the infamous Che Guevara after the revolution was to head the Instituto Nacional de Reforma Agraria, a government agency created to handle infrastructure tasks like road building and protecting the order of land redistribution and re-tasking where needed. Cab drivers have a smoke while waiting near terminal 3 at Havana's José Martí International Airport with a Russian made classic. Morning in Havana. Roosters are often louder than the traffic. Brutalist architechture is apparently everywhere in Havana, and dotted in parts of smaller cities. 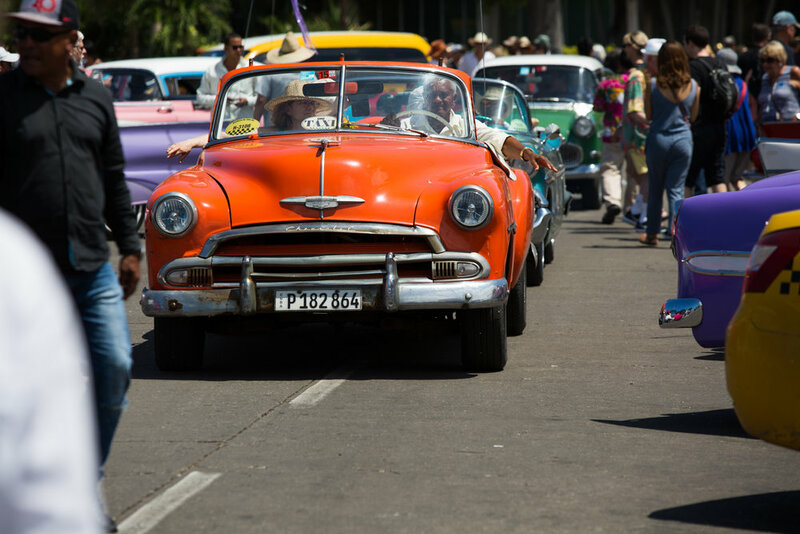 The original impetus behind my journal to Cuba: documenting classic cars from the last era of American business partnership. Many of the car parts in these cars have been replaced with home made spares, and mismatching parts. Overall though, very few of the old beasts were broken down on the road. José Martí Memorial tower stands at 109 meters (358 feet) tall in Plaza de la Revolución. The Plaza is a centerpiece of Castro's Cuba, with many important rallies being held there since its completion in 1959. Cars gather regularly in the square, and take a break while tourists of all walks admire the classics. 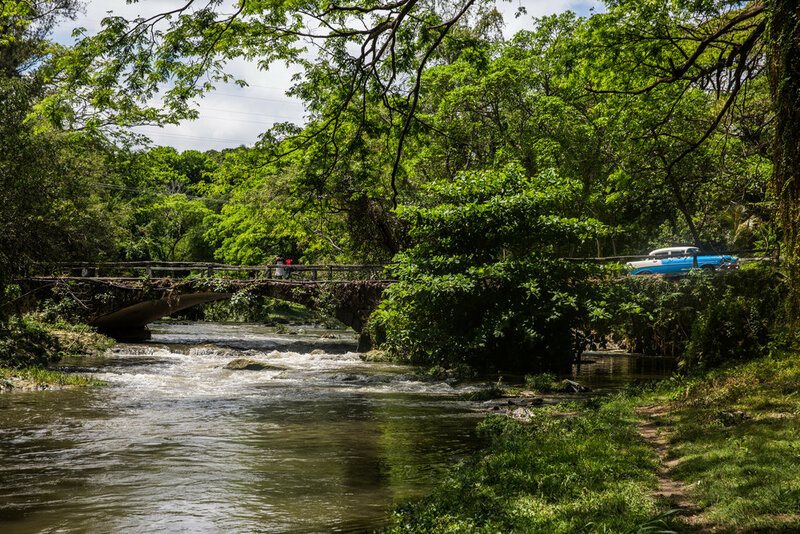 Jungles push up against Havana's city limits; a lush green nearly year round. Our wheelman from downtown to the outskirts. He displays what I believe to be an MS-13 tattoo on his hand with pride. Located on the Malecón, the US Embassy had been shuttered for over 50 years until the Obama presidency. Even now it stands fairly quiet it seems. After a public formation, the special police gear up and salute their CO. Some are glad to see me. Outside the Havana Cathedral; one of the 11 Roman Catholic cathedrals on the island, and completed in 1777. The Havana Biennial Art Exhibition takes places every two years; its primary purpose to bring about the Cuban contemporary art circles. The hammer and sickle; the iconic symbol of Russia's Communist Revolution. It was commonplace to see these along with Russian architecture and vehicles. A cocotaxi baking in the afternoon sun. While they only carry two passengers, they are generally less expensive but much louder than a taxi. A bust of Ernest Hemingway by José Villa Soberón sits inside the El Floridita bar. It served as one of Ernest's favorite watering holes from his time there between 1932 and 1939. While it wasn't the birthplace of the daiquiri, it is known as the cradle of it with bartender and later owner Constantino Vert at the helm, coupled with Hemingway as the resident tester. The bar still stands a powerful testing ground for juice based cocktail pros. Em danced just about ever chance she could get with the constant live beats found about Cuba. A city patrol talks about baseball. 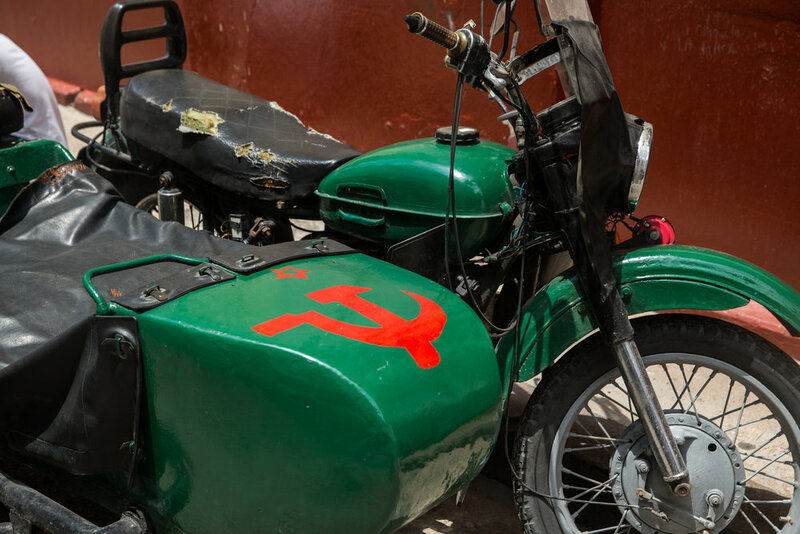 Cuba had some of the most unique paintjobs I'd ever seen. The capitol currently under renovation. notice the clean walls and pillars on the right hand side, with the left hand side next for its close up. An old mural of a cartoon was covered up, over it a scene of Spanish ships, and African slaves beating drums and floating with spectral chains. Landlines are abundant in Havana, as cell service is very limited throughout the island. The 99% pulling down the corporate giant. Written all over are the names of the biggest companies in the world. Any given afternoon you can get in on a futbol game. The Malecón is the most popular spot in Cuba. Crowds of people hugged the sea wall for miles to watch the sunset on a warm Sunday evening. Founded in 1514, sunset in Trinidad de Cuba was humbling every time. 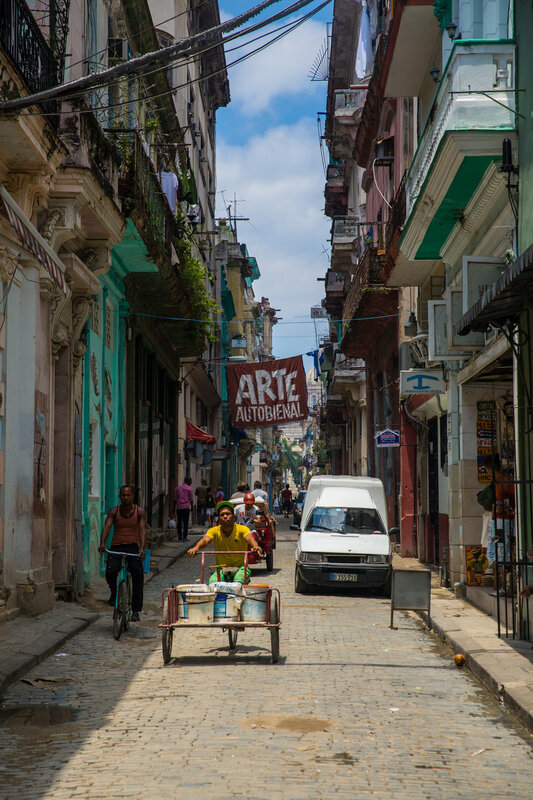 The coblestone streets still remain, couples gorgeously with the washed out pastels that Cuba is known for. Los Pinos takes a break while a young Cuban boy admires the trio. Technical know-how is a must in Cuba. Fresh replacement parts for most cars are near impossible to get. Kids play at school while we trek through the Escambray mountains. Most of the natives in Cuba rocked a greaser cut with shaved sides, but Dan stuck to his El Papa look. An average day after school in Trinidad. Rain rolling into the center of Trinidad over one of the many churches in the city on our last evening in Trinidad. Apparently Mexican coke isn't as much a rarity in Cuba. What most people will tell you is the most impressive scene in Cuba: Valley de Viñales. Limestone cliffs called mogotes raise from the floor of the tobacco farms of the basin. Katie andTequila riding through an old town near the farms of Viñales. At the house of our guide, his wife shows us their arabica bean treatment process. A lemon being cut for open before making the afternoon summer sipper of your dreams. 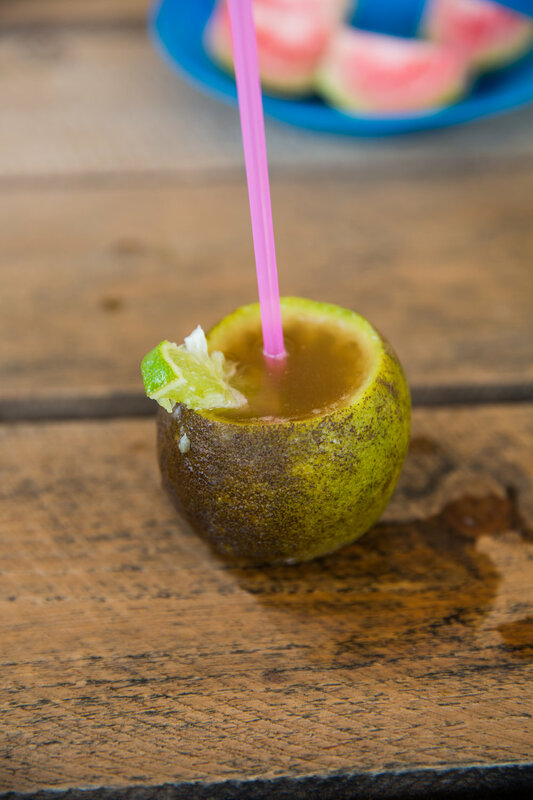 We poured fresh sugarcane juice and rum into the lemon, the squeezed it to let the juice from the lemon mix in. Sip and repeat. The Mural de la Prehistoria walks us through a chart of evolution in vivid color. A storehouse of Cuba's crown jewel, the tobacco leaf. It takes 6 months from start to finish to complete the entire cigar making process. The stem of the tobacco leaf contains 95 percent of the nicotine. Most Cuban's remove this in their rolling process. A fitting end to the primary part of our adventure. I found Cuba and it's people to be profoundly active and driven. Even in a communist state, the push for a better world seems endless, and that's not a problem in their eyes. Its breathtakingly bittersweet to be enveloped in a world where community is titanic, but the supplies to reach your full potential are under a dictator's rule. The more time I spent there, the less meaningful the embargo we have with Cuba felt. 90 miles away lies (at the very least) a portal to building blocks that Cuba needs to advance its infrastructure. The overall sense of thought towards US citizens in Cuba was overwhelmingly positive, but I never got the sense that Cuba will be as negatively changed as people in the US think it will become if the embargo is lifted. Sure, pockets of all inclusive hotels will pop up, but luxury has existed in the heart of Havana for those who want it for some time now. I hope to see Cuba grow into a free state now that US-Cuba relations have begun to ease, and access to information increases. This adventure further inspired me to take bigger leaps in the alcoves of the world to discover knowledge from around the globe. I'm also inspired to dig deeper into the particulars of Cuban society, and again visit the island someday with eyes open. Feel free to post any questions here, and make your way to Cuba while the classics still rule the streets.